Rakhi is basically a sacred thread of love Rakhi is basically a sacred thread of protection embellished with the love and affection of a sister for her brother. 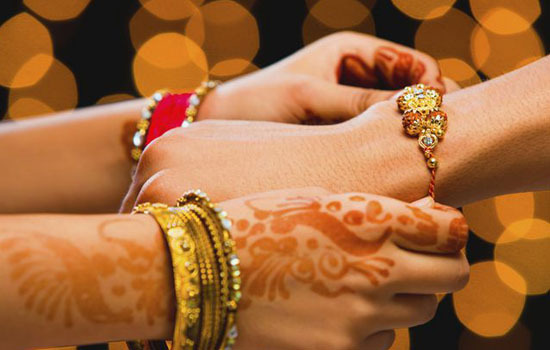 This day is also known as Raksha Bandhan and celebrated on the full moon day of the Hindu month of Shavana in India. This frail of thread of Rakhi is considered as stronger than iron chains as it binds the most beautiful relationship in an inseparable bond of love and trust. Rakhi festival also has a social significance because it underlines the notion that everybody should live in harmonious coexistence with each other. Not a single festival in India is complete without the typical Indian festivities, the gatherings, celebrations, exchange of sweets and gifts, lots of noise, singing and dancing. RakshaBandhan is a regional celebration to celebrate the sacred relation between brothers and sisters. Primarily, this festival belongs to north and western region of India but soon the world has started celebrating this festival with.....Rakhi is the physical symbol of the emotions involved with the festival. The emotions of love, affection and care. It is the sentiments that matter on this day and what can be a better expression of the sisterly love than a self maderakhi. Decorate the upper part with sequins, beads or religious motifs. If you are using multicolored threads arranged in some specific way, cut them short to a suitable length not more than 2. These days in vogue are rakhis made of kalava or moli (the read thread used for tying on wrist during a religious event). These are more suitable for those who have to keep the rakhi tied for a longer time, as in some faiths when it is removed after three days or it is removed on the Dussehra which falls in October. Take a 50" long thread and fold it in the middle. Plat the thread in the desired manner. Tie the cotton thread leaving some space at the ends. Remove all the loops from the ends. Stick the religious symbol or rudraksh in the middle and if you want to decorate rest of the length of the rakhi with beads or tiny shells. You can stick them or even stitch them on the braided thread. Take 20-24 inches long silk thread strands in a bunch. If you want to make multi colouredrakhis take silk threads of different colours. RakshaBandhan Tie a tight knot with a cotton thread on the one-fourth part of the silken thread bunch. The one-fourth part will be made into a rakhi while the three-fourth will be the string to tie around the wrist. RakshaBandhanNow make sure the heads of the silk threads of the one-fourth part of the bunch do not remain in loops, in case they are, cut them with a pair of scissors. RakshaBandhan Once they are independent of loops, with a toothbrush rub hard on these threads and brush them with strong strokes by holding tight on the knot. With repeated strokes the silk threads turns fluffy and RakshaBandhan soft. RakshaBandhanTo make the string, divide the three-fourth part of the silk thread in two equal parts and plait them separately . At the end tie a knot and brush the end again.